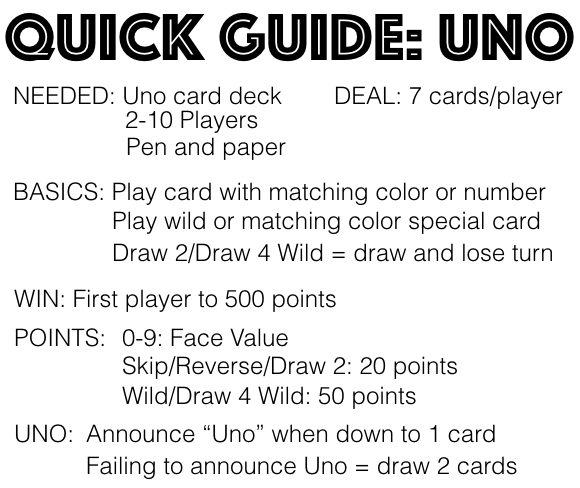 Uno is an easy-to-play card game that can be enjoyed by 2-10 players. Get rid of your cards fast to win this game! The video tutorial and explanation are below. Deal: 7 cards to each player, 1 card at a time. Place the remaining deck (draw pile) in the middle and flip over the top card to start the discard pile. Objective: The object of the game is to be the first player to get rid of all the cards in your hand each round. Cards that match the top discard in color or number can be played into the middle. Skip - When played the next player's turn is skipped. The Skip card can be played on a matching color discard or a previously played Skip. If a Skip is the first discard flipped, the player left of the dealer is skipped and the next player begins play. Reverse - When played the direction of play is reversed. The Reverse card can be played on a matching color discard or a previously played Reverse. If a Reverse is the first discard flipped, the dealer begins play and play continues counter-clockwise. Draw 2 - When played the next player must draw 2 cards and loses his/her turn to play. The Draw 2 card can be played on a matching color discard or a previously played Draw 2. If a Draw 2 is the first discard, the player left of the dealer draws 2 cards and loses his/her turn to play. Wild Card - When played the player of the card announces a color. The next player must play a card in the color that was announced. The Wild card can be played on any card. If a Wild is the first discard flipped, the player left of the dealer choses a color to begin play. Draw 4 Wild - When played the player of the card announces a color. The next player must draw 4 cards and loses his/her turn. The next following player then must play a card in the color announced by the player of the Draw 4 Wild. A Draw 4 Wild can be played on any card as long as the player cannot play a card in the matching color of the top discard. If a Draw 4 Wild is the first discard, bury the card back into the draw pile and flip over the next top card. Game Play: The player left of the dealer is first to play. A card can be played in to the middle If it matches the top discard in color or number, or a special card can be played (see above). If a player cannot play, a card is drawn from the draw pile. If the card drawn can be played, the player can play it. Once a player is down to 1 card left, he/she must announce “Uno.” Uno should be announced as a player is playing his/her second to last card. If a player fails to announce Uno with only 1 card left, another player can catch it by calling Uno before the next player plays a card. If caught not saying Uno before the next card is played, the player with 1 card must draw 2 cards from the draw pile. The first player to get rid of all his/her cards wins the round. Score: The player that got rid of his/her cards first is awarded points based on the cards remaining in the other players’ hands. The first player to 500 points wins the game. Rule: If the draw pile runs out before a player wins the round, reshuffle the discard pile to make a new draw pile.